The new Goldie Blox ad has been making the rounds on my Facebook. It features three little girls and a Rube Goldberg device built from tea sets and princess costumes, and it’s a genuinely delightful ad. I showed it to Kiera, who loved the ad and was disappointed when I told her that in fact, Goldie Blox were not a Rube-Goldberg-device building kit. I have to admit that I’m also bothered by the number of parents who will contemptuously put down princess play. Unless you’re raising your daughter in a box, she’ll probably go through a “princess” phase between about age three and about age five. For an awful lot of little girls, a “princess” is a girl who gets to have adventures while wearing fabulous clothes. Disney Princess costumes tend to be cheap yet indestructible, which is why they are also ubiquitous. 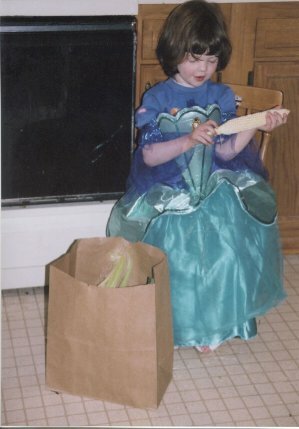 Molly, age three, in a princess dress. Molly, at three, liked to dress up in pretty dresses and sparkly shoes (the red ones they sell at Target every December) and she would regularly choose things with princesses on them. Ten years later, she does Lego Robotics at her school, she’s in a program at the U of M for gifted math students, she plays roller derby, and she acts like the color pink is kryptonite. But I think we need to start from a place where we believe that girly play is valid. If we tell a little girl that she is DOING IT WRONG because she wants to pretend to be a princess — you know what, this is NOT how we get more girls in STEM careers. There is no wrong way to play. Okay, actually, I take that back. Throwing blocks at your sibling is the wrong way to play. But there’s nothing wrong with dressing up in costumes, and we do girls a disservice when we treat their preferred type of play as unacceptable because it is too girly.